Timing or recording individual activities is one of two methods that QuickBooks 2012 supplies for tracking the time spent that will be billed on an invoice as an item. If you want to record service activities as they occur, choose the Customers→Enter Time→Time/Enter Single Activity command. QuickBooks displays the Time/Enter Single Activity window. To time or record a single activity, record the activity date into the Date box. Use the Name box to identify the person performing the service. In the Customer:Job box, identify the customer or the job for which the service is being performed. Select the appropriate service item from the Service Item drop-down list and the appropriate payroll item from the Payroll Item drop-down list. If you’re tracking classes, predictably, you can also use the Class drop-down list to classify the activity. The Notes box should be used to record a brief appropriate description of the service. This description appears on the invoice, so be thoughtful about what you write. Manually record time: You can manually record the time spent on an activity by using the Duration box to enter the time. If you spent 10 minutes, for example, enter 0:10 into the Duration box. If you spent 3 hours and 40 minutes, enter 3:40 into the Duration box. Have QuickBooks record the time: You can also have QuickBooks record the time that you spent on the activity. Just click the Start button in the Duration box when you start the activity, and click the Stop button when you stop the activity. If you want to pause the timer (while you take a phone call, for example) click the Pause button. After you describe the activity you’re performing in the Time/Enter Single Activity window, click the Save & New or Save & Close button to save the activity information. Verify that the Billable check box is selected. 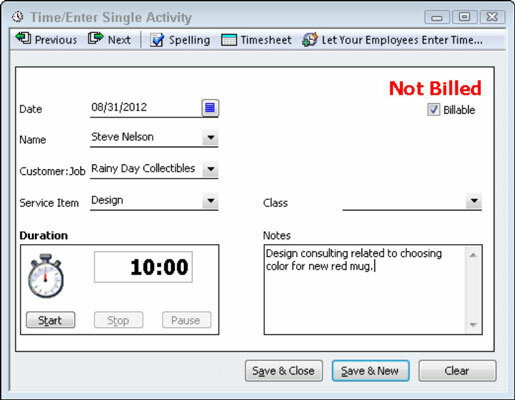 The Billable check box appears in the upper-right corner of the Time/Enter Single Activity window. By selecting the Billable box, you tell QuickBooks that it should keep this record of a billable activity for later inclusion on an invoice. You can use the Previous and Next buttons that appear at the top of the Time/Enter Single Activity window to page back and forth through your records of activity timing. Note, too, that the Spelling button is also available on the Time/Enter Single Activity window. You can, therefore, click the Spelling button to spell check the notes description that you enter — which is a good idea because this information will later appear on an invoice. QuickBooks also allows your employees to enter their time directly. Choose the Customers→Enter Time→Let Employees Enter Their Time command to get information about how this web service works.